An example of a typical temperature measurement setup that includes a 4-20 mA loop. Verifying a 4-20 mA loop is a crucial step in any temperature calibration. A full verification includes testing the output of the transmitter, the wiring, input to the control system as well as the control system input card and the return wiring back to the transmitter. Even though such instrumentation is typically 24V and considered low-voltage technology that doesn’t mean technicians shouldn’t take safety precautions. Best practice is to never assume low voltage, and always take the same precautions you would take while working with high power electrical circuits. Handheld temperature calibration tools, such as the Fluke 721 and the Fluke 754, can calibrate temperature instrumentation devices in-situ, without removing them from the process. 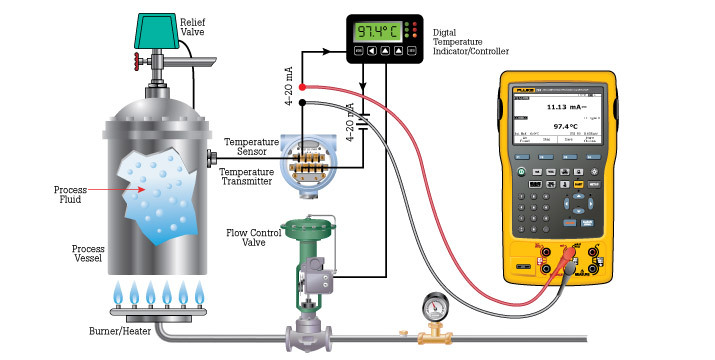 The Fluke 754 even can service HART "smart" transmitters with a precision analog source and measure capability as well digital communication testing. Until recently, such HART work required two separate tools, a calibrator and a communicator. Plus, the Fluke multifunction calibrators can test pressure devices as well. That trims the tool set even further, and can even help minimize training on several different devices.